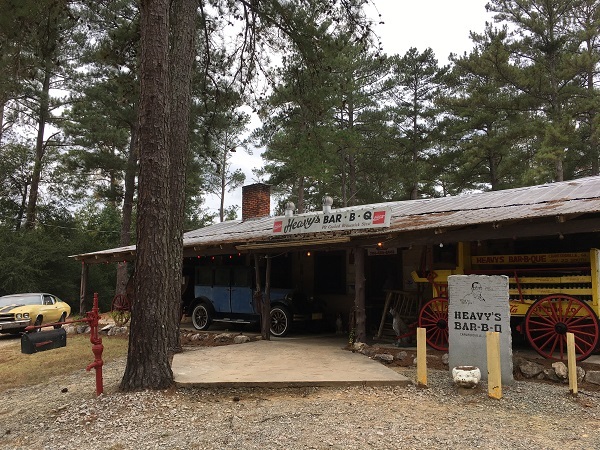 Heavy’s Bar-B-Q, Crawfordville GA – Marie, Let's Eat! Here’s a restaurant in a part of the state we rarely visit at meal time; we’ve usually been on our way to Augusta or Columbia early in the morning, before this place opened, and returning full and disinterested in stopping late in the evening. But since we were working in reverse on this trip, we were able to eat here, and enjoyed a spectacular meal. I dropped our friend Keith a line. He goes by the handle Chickenplucker and has documented eastern Georgia considerably better than we have, using a thread at the roadfood.com forums: Augusta, Georgia Just Ain’t No Place to Be. He was able to meet us, and we arrived a little ahead of him. Heavy’s is located about a mile south of I-20 in Taliaferro County, although Google somehow thought it was about four. 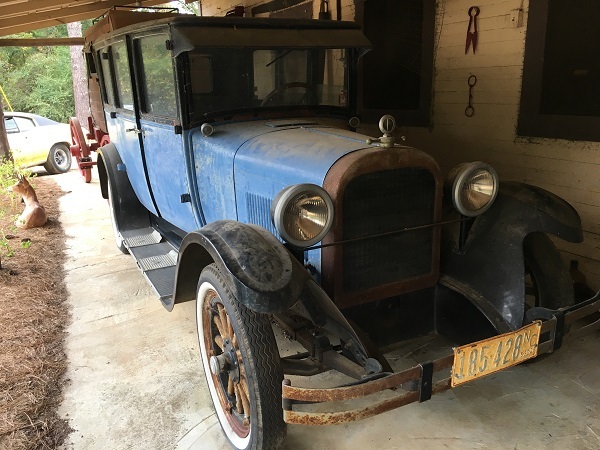 The property has more than a dozen antique cars and trucks collecting dust and pine straw. Our son was in heaven, running around and checking them all out. He wouldn’t have minded if our pal never showed up and we just stayed outside to play. Incidentally, I have not really played Where’s George? in a very long time, but I should have prepared and stamped a stack of ones for this trip. Taliaferro County is insanely, notoriously difficult to land a hit. Oh, well! Among all the other bric-a-brac and taxidermy on display here, you’ll find some signs for a business called Stella’s Roadhouse. That was the bar in the film Sweet Home Alabama which was made here in 2002. Heavy’s was transformed into Stella’s for the movie for the exteriors and some of the interiors, although an eleventh-hour decision to add a couple of shots meant that the dressed inside of Heavy’s had to be recreated in a Hollywood studio rather than returning the entire production to Georgia for half a day! Keith joined us and we caught up and enjoyed some absolutely fantastic barbecue. I did think that nine dollars a plate was a little high for this part of the state, but that was before I saw how much food they give you. It’s just as well Marie was stuffed from our first lunch in Augusta and I only ordered one plate instead of two. She and I, working together, couldn’t finish all this terrific pork. I fell in love with barbecue after discovering Paul’s in Lexington GA, about thirty miles away. (Only thirty?!) 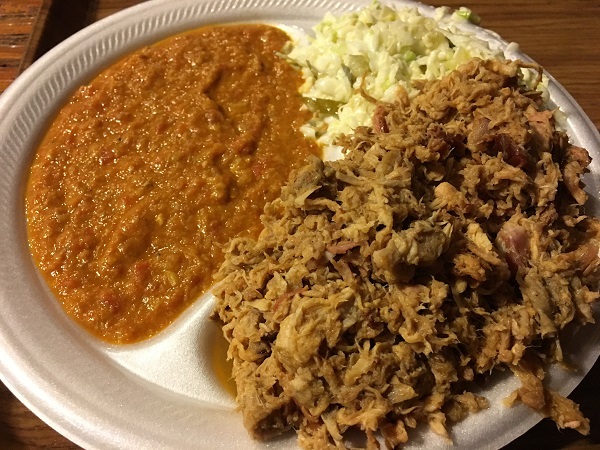 Crawfordville is a little ways outside that “triangle” around Athens that I’ve often discussed, but I contend that the Athens area is home to some of the country’s very best barbecue, and Heavy’s is really similar to what I’m talking about. The pork is mildly smoky and needs some sauce, and the sauce here is wonderful. It’s a thin sauce with tomato and vinegar. It’s quite like the sauce at nearby Holcomb’s (in White Plains and in Greensboro), but the meat here is served dry, unlike Holcomb’s, which simmers the meat with a little sauce. Add in some fabulous stew and a delicious slaw that has a nice pickle taste and it’s a great meal. Paul’s has sadly closed, but Heavy’s serves a pretty similar flavor profile. I’m really glad that we stopped by. “Heavy” was the nickname of the restaurant’s original owner, William Grant, who opened the restaurant in 1978. He passed away in 2005, and his wife Louise joined him last year. I think that Heavy’s is still in family hands; I believe that all of the taxidermy on display comes from he and his son’s days hunting. The restaurant was only about a third full, and nobody was as noisy as we were, telling stories and trying to entertain our loudmouthed youngun. I suspect that the reason they serve such a large helping of food here is because many of their guests, like the Grants, are hunters and want to have a gigantic meal before they spend all day in the woods. About half the other customers were there by themselves, quickly eating at one of the long picnic tables and getting a refill of tea from the pitchers set before them, before making their way off to the forest. We had to make our way as well; we hadn’t been to Atlanta in many, many weeks and we had a surprise for our son in store. It was great to break bread with Keith again, and enjoy some barbecue in the style that I might enjoy the most, and which we cannot easily get anymore. Posted on December 7, 2016 by Grant G.Posted in barbecue, georgiaTagged barbecue, crawfordville, georgia.